(Bloomberg) -- A few weeks ago, Jay Gist, an aspiring cook working in marketing, walked into a Safeway near Sacramento, California, saw a kiosk for the meal-kit company Plated and walked out with everything he needed to make chicken au jus with orzo and broccoli for his wife and 12-year-old daughter. Meal kits, which appeared a few years ago as online subscriptions from upstarts like Blue Apron Holdings Inc. and Home Chef, have been migrating to the supermarket. Kroger Co. bought Home Chef last year; Safeway Parent Albertsons acquired Plated in 2017. 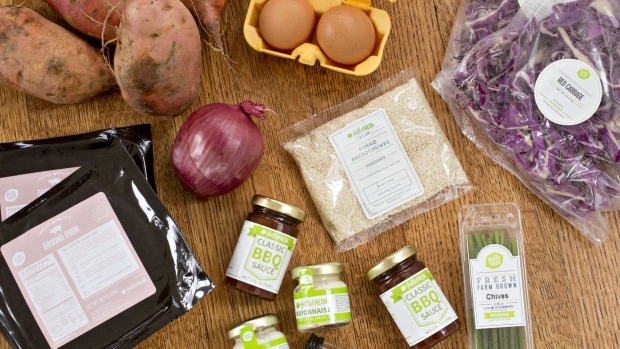 HelloFresh SE, the European meal-kit provider, is available in almost 600 U.S. supermarkets. Blue Apron, which recently named a new chief executive, is in discussions with prospective partners after scrubbing an experiment with Costco Wholesale Corp.
Can meal kits, which have so far failed to support profitable businesses on the web, prosper offline? Gist’s experience is instructive. After purchasing the Plated kit, he made another pan sauce, this time with a pork chop, adding the technique to his growing repertoire. Gist has not, however, bought another Plated kit, though he says he may again in the future. The struggle to persuade consumers to keep buying is exactly what has plagued the online meal-kit business since its inception. Meal-kit subscriptions were originally marketed to people who wanted to cook but didn’t know what or how. Blue Apron offered three meals a week for $9.99 per person per meal, plus shipping, sending the raw ingredients and easy-to-cook recipes straight to the home. There were plenty of fans at first but the companies were soon beset with complaints: The meals were too expensive, you had to plan ahead, and people felt guilty throwing away all the packaging required to keep ingredients fresh. Luring and retaining customers required margin-eating discounts and often didn’t work. By removing the subscription part of the model, the theory goes, customers will feel less encumbered by the necessity to plan multiple meals ahead of time and more likely to grab a box at the supermarket and take it home to whip it up that night, just as Gist did. Without the cost of shipping, prices should come down and spur sales. Some early numbers are bearing this out: In-store meal kit users spiked by 2.2 million households in less than a year, according to Nielsen, representing 60% of industry user growth. The strategy solves the common “what’s for dinner tonight?” problem—consumers can run into a store, pick a meal, and cook it that night—but there are already signs that it could be flawed. Even without shipping costs, meal kits are still pricier than buying separate ingredients and chopping them yourself. And while customer churn has been an ongoing issue for the online subscription model, winning loyalty is even harder in the supermarket, where countless options, many less expensive, vie for shoppers’ attention. Companies are already second-guessing the brick-and-mortar model. Costco dropped Blue Apron to make space for seasonal products, and Albertsons, which only started selling Plated meals at Safeway and Shaw’s last year, earlier this month scaled back the rollout and fired 10 percent of its New York staff. For meal-kit companies looking for a killer app, the answer may lie in picking niches rather than trying to be all things to all people. Sun Basket Inc., which is preparing for an IPO and recently sold a stake to Unilever, is targeting consumers looking for gluten-free, paleo-diet and vegetarian meals. It still operates as an online subscription. Marley Spoon, which has teamed up with Martha Stewart in the U.S., sells more affordable meal kits aimed at families who already cook rather than trying to persuade newbies to pick up a chef knife and spatula. The Berlin-based company recently rolled out a sub-brand called Dinnerly that sells for $4.99 per serving (plus $8.99 in shipping). Founder and CEO Fabian Siegel says recurring customers were responsible for about 90 percent of Marley Spoon’s $100 million in sales last year. The company, which operates in six countries, has no plans to put meal kits in grocery stores. “We are a service for customers with a regular life, who cook for their families,” Siegel says. --With assistance from Stefan Nicola.